Captain Stuart Broad says England will not be distracted by off-field issues when they defend the World Twenty20 title in Sri Lanka. England are without 2010 man of the tournament Kevin Pietersen, whose international future remains in doubt. "That's not something that affected us," said Broad after England beat South Africa by 28 runs on Wednesday. "Going to Sri Lanka, we have to have all our focus on making sure we start that tournament well to gain momentum." A comprehensive victory over the Proteas at Edgbaston earned England a 1-1 draw in the three-match series ahead of their flight to Sri Lanka on Thursday. "Craig Kieswetter helped set it up but Jos Buttler was the difference between the sides with his clear mind and touch over the top. It's a great example for all players - his first option was to hit the ball straight and hard. 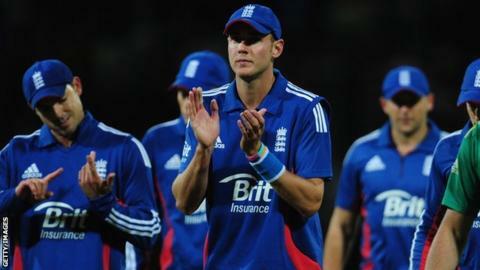 This win bodes well for England for the World Twenty20." In a match shortened to 11 overs per side by rain, England posted 118-5, with Craig Kieswetter hitting 50 and Jos Buttler a thrilling unbeaten 32 from only 10 balls. "Jos changed the momentum of the game and that's what he's in the side for," added Broad. "You look for guys like that in Twenty20 cricket to change the game with bat and ball." England restricted South Africa to 90-5 on a bitterly cold night in Birmingham, with Tim Bresnan and Graeme Swann taking two wickets apiece. "Although the cold will be different to Sri Lanka, that wicket won't be far off what we will be playing on," said Broad. "It was quite slow and had a bit of turn in it. "The experience Craig Kieswetter showed to bat deep allowed the other guys to flourish at the end." Buttler came to the crease with only 16 balls of the innings remaining, but helped England add a further 54, with 32 coming off one Wayne Parnell over, the second most expensive in Twenty20 international history. "I swung hard and it came off," said the Somerset wicketkeeper-batsman, who had scored just 36 runs in 10 Twenty20 internationals before this match. "International cricket hasn't gone as well as I would have hoped so far and now I'm just glad to contribute to a winning side. It's good preparation and I'm looking forward to Sri Lanka." South Africa captain AB de Villiers said: "I can look back on quite a few things that turned the game. "I made a couple of tactical errors and probably should have used Faf du Plessis's leg spin. "But we played wonderful cricket throughout this summer, and I'd rather hang on to those positives than the negatives. "The conditions are going to be a hell of a lot different in Sri Lanka. It's something we're prepared for; we'll just go there and adapt as quickly as possible."